If we think of elephants in India, Sri Lanka, or Nepal, we are likely to think of a majestic land mammal that has been deployed in war, carried kings, and featured in myth and religion. We might think of the mahout, a romantic figure dedicating his life to intimate companionship with a highly intelligent and social animal. We could imagine an animal that roams freely in landscapes reserved for its preservation, which inspires scientific curiosity, but that also has violent encounters with local people. We might think of the elephant as an animal afflicted by humanity, as a giant in chains or a free-ranging rogue. What this reveals is that in South Asia the elephant is a culturally and historically significant animal with which humans have developed diverse relations and modes of appropriation, and that human population increase, agricultural expansion, and technological development presents us with political, ethical, and ecological challenges. As a budding anthropologist who had already developed an interest in South Asia, it was this appreciation of the social and environmental significance of elephants that prompted me to develop a research program that, nearly 15 years later, shows no signs of petering out. Chitwan elephants going to graze. Photograph by Piers Locke. While studying for a masters’ degree in South Asian Area Studies I was inspired to formulate a proposal for doctoral research involving an ethnographic study of captive elephant management. At that time this was entirely novel, representing uncharted anthropological territory. I was at the School of Oriental and African Studies (SOAS), University of London, reflecting on possible doctoral topics when I recalled Travels on my Elephant by Mark Shand, a book I had read while first exploring India as a backpacker a few years earlier. If the story of a man who purchases an elephant, becomes her mahout, and journeys across India made for worthy travel literature, perhaps something similar would warrant academic inquiry. As a social scientist whose mode of research typically involves the sustained real-world immersion of participant observation, the idea of replicating the experience of intense interspecies companionship documented by Shand made perfect sense. The challenge then was to do this myself in the context of ethnographic inquiry; documenting the occupational culture of mahouts in the institutional context of the elephant stable, appreciating the intimacies of lives lived with elephants, and analyzing the expert knowledge, skilled practice, and communicative competency involved in managing relationships with elephants. Mahout driving an elephant. Photograph by Piers Locke. The location I chose was the Chitwan National Park in Nepal. Located in the lowland forested belt known as the Tarai, adjacent to India, here was a place where long-standing traditions of captive elephant management persisted, now deployed to modern endeavors of protected area management, biodiversity research, and wildlife tourism. After considerable persistence securing authorization from the Department of National Parks and Wildlife Conservation in the capital Kathmandu, my research assistant Satya Man Lama and myself were able to commence our research at the government elephant stables, staffed primarily by the indigenous Tharu, who had been involved in the elephant business for centuries. A Maoist insurgency was raging at the time, making life hard for Satya, who normally earned his living as a trekking guide in the mountains. As a result, the prospect of working with me was an appealing one. Although he was a Tibetan Buddhist Tamang from the higher altitudes, he was ideally suited for this role in the jungle lowlands because his ethnicity was similarly ranked in Nepal’s old caste system. Only repealed as a legal system of stratification in 1964, both Tamang and Tharu had been classed as enslavable alcohol drinkers or masine matwali. If a high-caste guide had accompanied me, I would have experienced difficulty penetrating the private world of the elephant handlers, a subaltern group whose expertise in an occasionally dangerous form of custodial labor integral to lowland protected area management was rarely acknowledged. At first we simply visited the government stable at the village of Sauraha, a bustling hub for tourism, park management, and biodiversity research. Later the chief elephant handler, the adikrit subba, invited us to take up residence at the secluded Khorsor Elephant Breeding Center on the edge of the park. It was here that he said to me; “Piers, if you want to understand who we are and what we do, you will have to do it for yourself.” This represented everything that I had hoped for—a chance to apprentice as a mahout for myself! And so I was assigned to Sitasma Kali, a gentle female of 20 years, accompanied by her two year-old son Kha Prasad, and attended by her human care team. On the one hand I was a privileged guest, but on the other I was now a lowly mahut, subordinate to the higher-ranked patchuwa (grass-cutter) and phanet (driver). 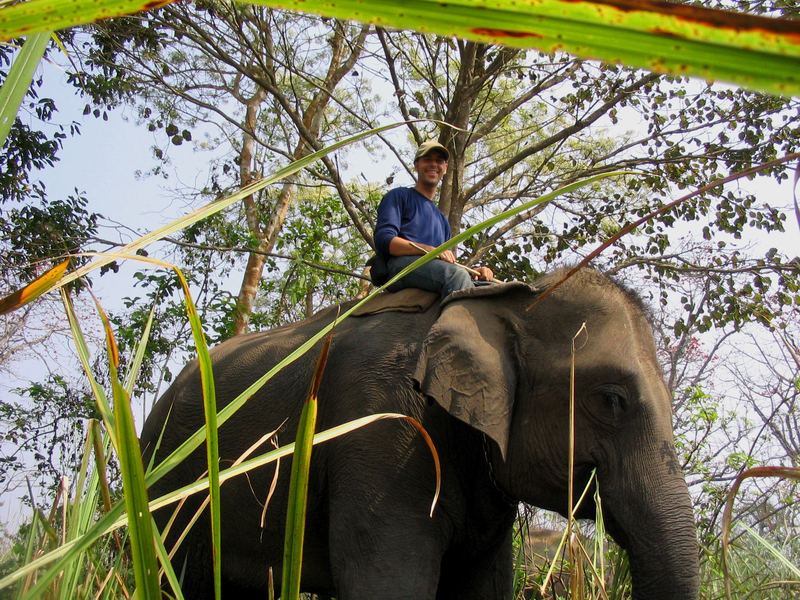 Anthropologist Piers Locke driving his elephant, Sitasma Kali. Photograph by Piers Locke. I began participating in the daily routines of elephant care; early morning grass cutting inside the park, the manufacture of nutritional grass packages containing rice, salt, and molasses, bathing, daytime grazing, and evening feeding. 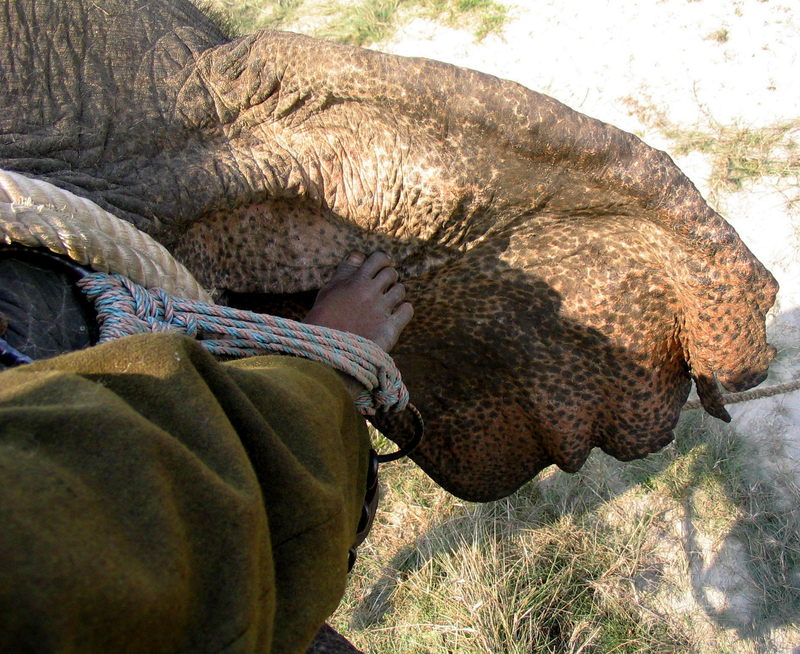 Under the instruction of the experienced phanet Ram Ekval, I began developing the practical skills and interspecies communication essential for effectively tending to and riding an elephant. At this point, however, I realized the limitations of my research methodology, which was all about investigating human social worlds rather than the worlds they share with nonhumans. What had begun as a study of a human practice of animal keeping now had to be redefined as a study of the shared lives of humans and elephants. It was a shame I was not better equipped with expertise from the animal behavioral sciences—which could complement my ethnographic training—for I was conducting research with two kinds of person, only one of which was human. Sitasma was also someone with whom I learned, communicated, and developed a trusting relationship. By attending to Sitasma as a companion and research participant, I found myself conducting a new kind of interspecies ethnography that implicitly challenged the humanist epistemology of conventional anthropological research. 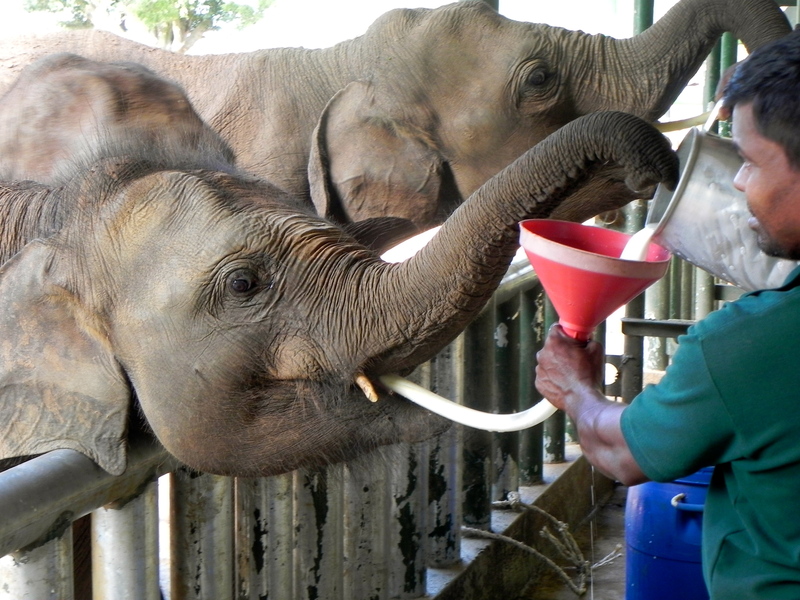 Orphaned elephants receiving milk at the Uda Walewe Elephant Rehabilitation Center, Sri Lanka, 2013. Photograph by Piers Locke. Later I would discover a new approach in anthropology called multispecies ethnography, for which a more-than-human approach to human-elephant relations was well suited. Taking inspiration from this I outlined a new kind of interdisciplinary program for studying human-elephant relations, which I call ethnoelephantology. As a model for studying intersections with a nonhuman species, ethnoelephantology argues that we must attend to elephants as subjective agents, must consider their social, historical, and ecological entanglements with humans, and should seek to incorporate perspectives from the humanities, social sciences, and natural sciences. It is this research agenda that informs my continuing work and that brought me to the Rachel Carson Center. It includes new research on human-elephant conflict in Sri Lanka and on the historical photography of human-elephant relations in colonial South Asia, supervising research students on other human-elephant topics in other places, facilitating interdisciplinary networks, producing a multidisciplinary collection concerned with humans and elephants in South Asia, and of course, finally writing a monograph about my field research in Nepal. Piers Locke was a Carson Fellow from 2014 to 2015. He is also the co-producer and anthropological consultant for the ethnographic documentary Servants of Ganesh, which concerns the training of a juvenile elephant called Paras Gaj at the Khorsor Elephant Breeding Center.